• Rash on Neck Lice. Parents often wonder why kids get a rash on the back of their neck that looks like lice bites. • In fact the red spots on your child’s neck just under the hairline are not lice bites. Rather, the red spots are the signs of an allergic reaction to lice bites. • First of all when head lice take a bite the bugs inject saliva into the scalp. In addition during feeding lice leave behind an anaesthetic at the bite site. Furthermore lice need to introduce an anticoagulant while taking a blood meal. • Your child can exhibit an allergic reaction to these lice bite substances and thus may develop a rash in on the back of the neck. Rash on Neck Lice. 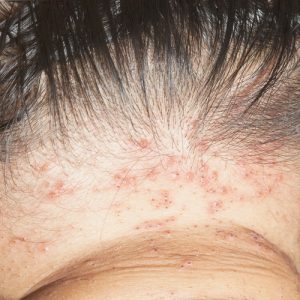 Actually lice bites on the scalp are not visible to the human eye. Especially relevant, you cannot feel a head louse when it is biting you. Unlike mosquitoes, gnats, midges or other insects that feed on human blood, lice bites are not felt. In addition an itchy scalp is an uncommon lice symptom. Rash on Neck Lice. If you are curious about how to treat an allergic rash on the back of the neck, an antihistamine cream or lotion or spray can alleviate itching symptoms. It is important to note that it can take up to 2 weeks for itching symptoms to resolve after you have removed all lice and nits. Therefore you do not need to worry that your child has a head lice reinfestation if he/she still has an itchy scalp. In addition the neck rash may not disappear for up to two weeks after a complete lice infestation treatment. The signs of lice are often non-existent, except for head lice bites on the neck. Since lice bites are invisible, parents often ask what does lice look like. ← Spring Vacation Plus Head Lice.